Fiction – paperback; Picador; 276 pages; 1999. Night Letters was published in Australia to critical acclaim in 1996. The book comprises a series of 20 letters written on consecutive nights by an Australian man staying in a Venice hotel. The man, who is named Robert, has been diagnosed with an incurable illness and while the disease is never named one gets the impression that it is HIV. These letters, which are not addressed to anyone in particular (but are effectively you, the reader), are filled with Robert’s wide-ranging thoughts on travel, love, religion and mortality. But the common theme, which threads in and out of the often meandering narrative, is man’s search for paradise and whether, in fact, it exists. This is underpinned by references to Dante’s The Divine Comedy, which Robert is reading out of sequence, so that when he finishes Paradise he feels “oddly becalmed […] if that didn’t bring you to a point of absolute stillness, nothing would”. As Robert narrates his often mundane, sometimes frustrating and occasionally menacing travels through Locarno, Vicenza and Padua, he offers fascinating glimpses of the people and places he encounters along the way. In Locarno he befriends an English woman wearing a mysterious amulet — “a hugely endowed male copulating with a large-limbed female, all in exquisitely fine detail, every bead in the bracelets, every toe picked out” — who spends days telling him about the history of the tiny gold brooch she wears. And in Venice he meets another hotel resident, a German professor, with whom he shares many discourses on history and philosophy, mainly on how the famous Venetian residents Cassanova and Marco Polo represented “completely different ways of travelling — and therefore of living out your life”. I have to admit that Night Letters initially failed to win me over. I actually considered abandoning it. But I’m glad I persevered, because once I understood this was a novel about storytelling — there are references to famous novelists throughout, including Patricia Highsmith, Ruth Rendell and Salman Rushdie — I truly enjoyed it. There are stories within stories, and once you realise that these all combine weight to Robert’s search for meaning, you wonder why you didn’t “get” this much earlier. Journeying is, after all, so fundamental to the way we humans think of ourselves and assign our lives a meaning. Every second book you read is about some kind of journey, really, isn’t it? And we constantly talk about paths in life — ways, roads, progress, stages and so on — all travel metaphors, when you think about it. In fact, I had to do everything within my power not to underline about 90 per cent of the sentences in this book, because so many of them resonated with me. Night Letters is an incredibly subtle novel, but it’s a wise one too. It won’t appeal to everyone, but I loved its intelligence, its humanity and its big-picture look at life, so much so that when I got to the last page I immediately wanted to turn to the front to read it all over again — and that doesn’t happen very often. And do read it if, like me, you have a penchant for anything set in Venice — Dessaix captures the city so perfectly you’ll be rushing to book your air flights! If I ever find a copy, I will be prepared for what to expect when first starting it. Isabel, it’s a wonderful book but so different to anything I’ve ever read before, hence it took me some time to get into the swing of it, to work out exactly what it was about. 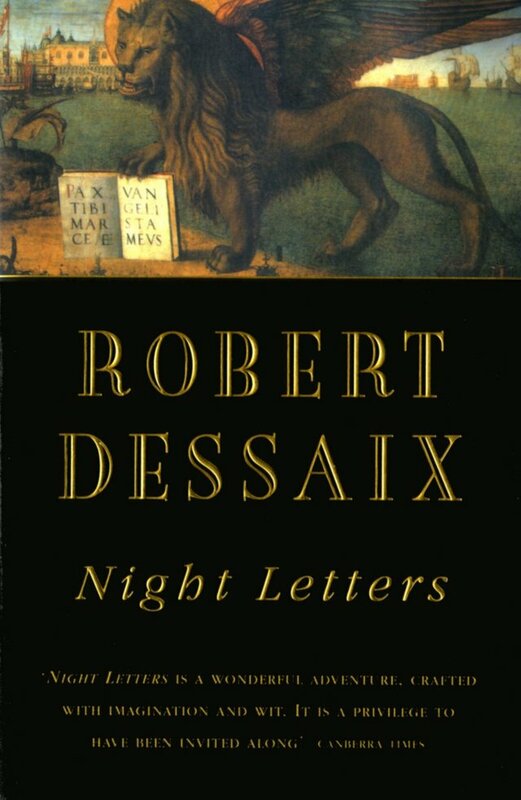 I think Dessaix is the most evident dark horse of Australian letters. A Russian literature academic at one time, Dessaix now works in the Oz cultural industry – forget the title. I’ve see him speak. A thoroughly cultured individual with a flair for accuracy. Unfortunately, he is not easily slotted into the ‘scene’. While Malouf and Moorehouse are the reigning ‘monarchs’ of the ‘scene’, Dessaix appeals to the discerning. In fact, Malouf’s poetry is not as good as some, and his short stories are also not the best there are. This IMHO. With Moorehouse, the point is different. Frank is sort of ‘in hiding’, possiby pending some national emergency. He wrote against recent ‘terror’ laws. He also shines as a de-facto national culture historian, unearthing unknown characters from the archives (Australians are notoriously lazy when it comes to recognising their artists – unless someone overseas does it first). Dean, I did a bit of “internet research” on Dessaix after reading this book. He certainly has done some interesting things in his time, no less his academic career in Russia. I’d be very interested in reading his autobiography, A Mother’s Disgrace, if I can ever track down a copy. after having read the book it is obvious the authour has respect for absoltuely nothing. A pointless author who wrote a pointless book which drags on and on.